In a medium sized bowl, mix all the ingredients for the marinade. Put the chicken in the bowl and coat them well with the marinade. Cover the bowl and refrigerate for at least one hour. When ready to cook, bring 3 cups of water to a boil. Add the rice to the boiling water and cook for 10 minutes. Switching off the heat, drain the rice and keep aside. Heat the oil in a large heavy bottomed vessel. Add the onions and garlic and cook till the onions become soft. Add the chicken along with the marinade. Cover and cook for about 5 minutes, until the juices from the chicken begin to release. Now add the chopped tomatoes, half of the orange pepper and the chili powder. Mix well, cover and cook for 5-7 minutes, until the tomatoes become mushy. Add the red kidney beans , mix well and cook uncovered for 2 minutes. Add the semi-cooked rice and coriander. Stirring constantly, cook for a minute or so. The rice should be well coated with the oil and the vegetables. Add the orange rind, orange juice and white wine and cook till most of the wine evaporates. Add 2 ½ cups of the simmering chicken stock, stir well and cook uncovered for 10 minutes. Add the remaining half of the orange pepper and chicken stock, taste and season with salt and pepper, stir well and cook until no liquid is left and the rice looks done. Switching off the heat, cover the vessel and let stand for 5 minutes. Then garnish with orange wedges and chopped coriander and serve. p.s: The original recipe also lists saffron threads. In case you want to add it to your paella, soak ½ tsp of saffron in 2 tbsps of hot water and stir it in along with the garlic. I shall be sharing this paella at all these food parties.. This looks great! 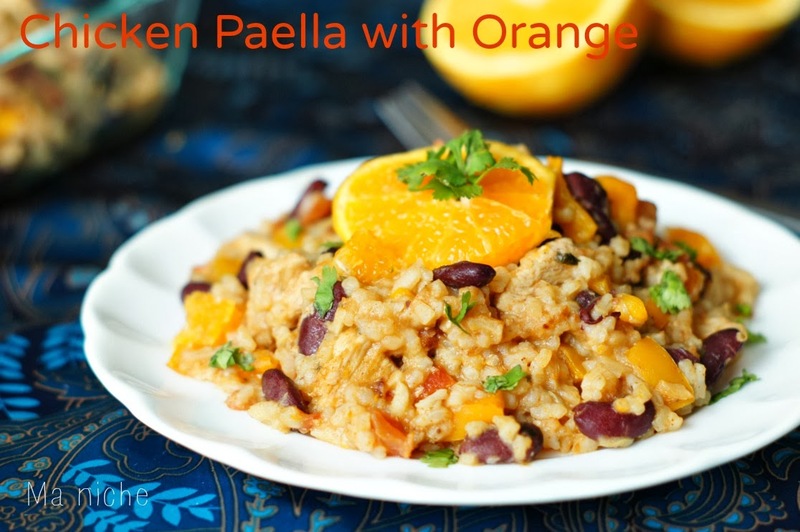 Orange with paella is a new combination for me, I'll be sure to try it! Your Paella looks wonderfully delicious! Love the vibrant color! Oh I can't wait to give this a try! Thanks for sharing at The Weekend Retreat!! Looks great! I am hosting a giveaway on my page this week (posted Monday) and I would love if you would stop by and check it out! I just made a paella. I love the orange in yours. Thanks so much for sharing this wtih us on foodie friday. 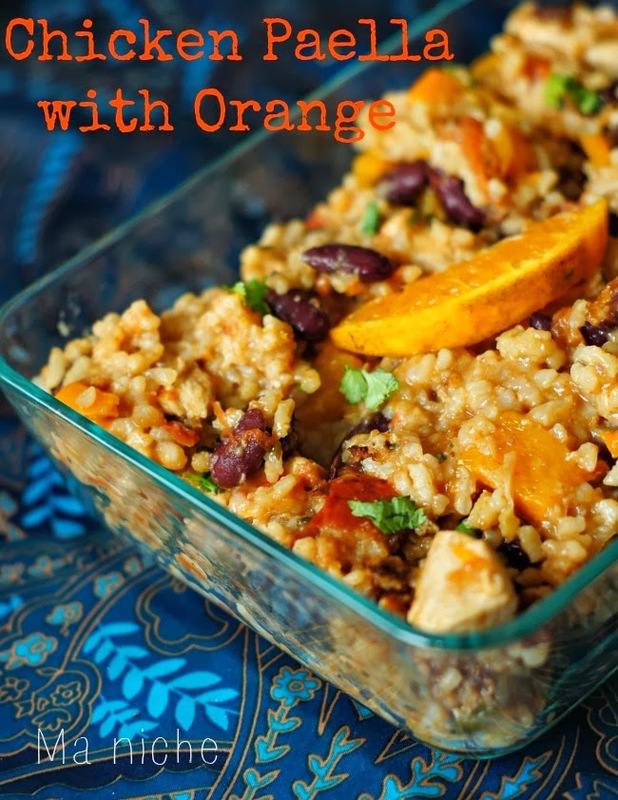 Love the combinations of flavors and all the color from the orange!! Can't wait to try this! 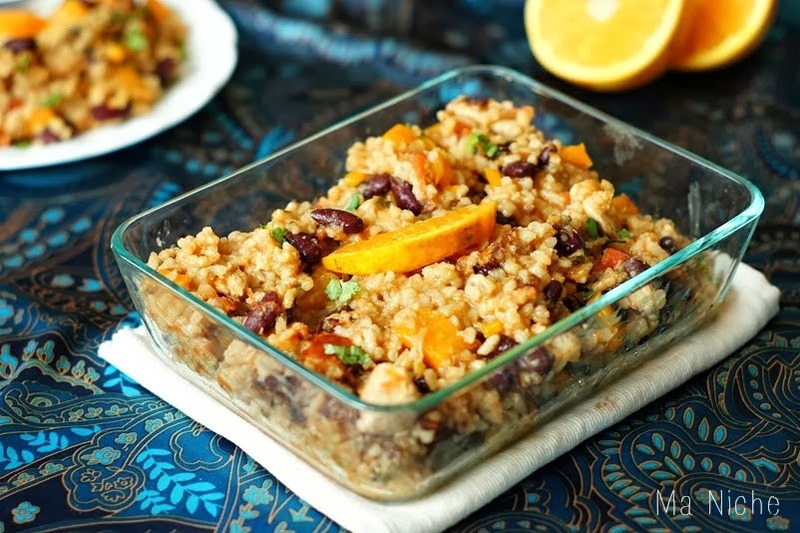 Just wanted you to know that I am featuring your recipe on foodie friday today. Will be pinning and tweeting it this week too. 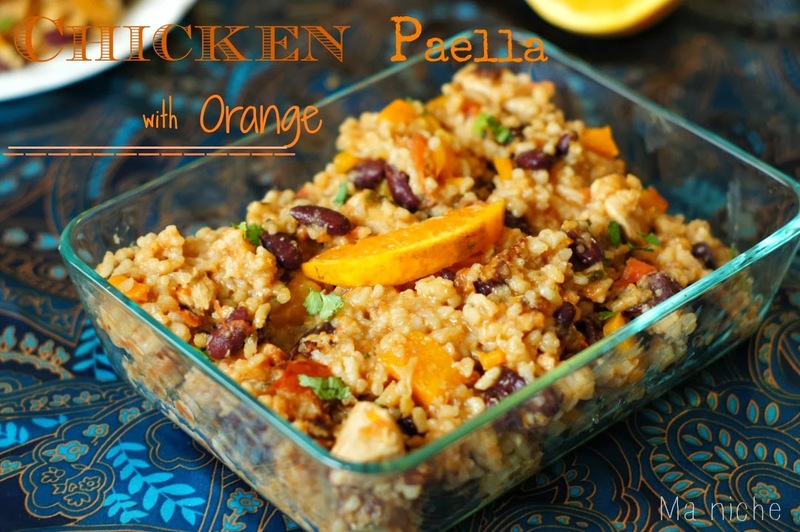 Your Chicken Paella with Orange is amazing, we would just love it! Thank you so much for sharing with Full Plate Thursday and have a great weekend. Your Chicken Paella with Orange is making my mouth water. I'll have to try this very soon. Thank you for sharing with the Clever Chicks Blog Hop! I hope you’ll join us again next week!